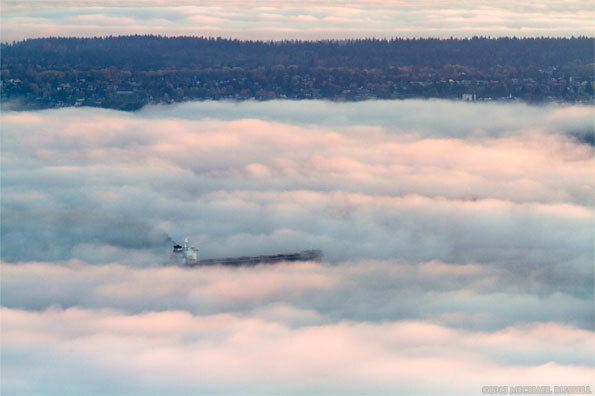 A Freighter anchored in Vancouver’s English Bay surrounded by fog. When I photographed Horseshoe Bay earlier this month some of my plans were changed by unexpected fog so I took the opportunity to check out the nearby Cypress Lookout. The lookout is up in Cypress Mountain Provincial Park in West Vancouver and offers a good view of the city of Vancouver and much of Metro Vancouver too. I was hoping to get a good spot (the lookout can be rather busy) before blue hour and made this photograph of a Freighter briefly showing through the fog while anchored in English Bay. The land you can see just beyond the freighter is Point Grey just to the east of UBC. For more photographs from the Vancouver area visit my Vancouver Coast & Mountains Gallery. 2016 Nature Calendar Now Available! Love this shot, Michael. Very moody.